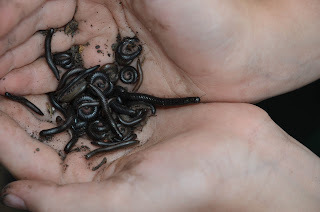 Hamby Home(in)stead ...: Millions of millipedes! As much as we enjoy most forms of wildlife, I am not greatly keen on our resident millipedes! We really noticed them last week. 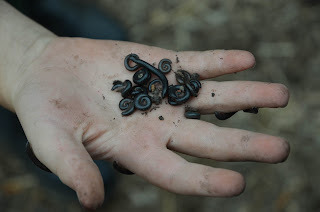 The rain had caused many to surface and we stepped carefully on the ground, lest we squish any. It seems we needn't have been so cautious as there is hardly any shortage of the critters! From some quick research this morning I have learned they are an (accidently!) introduced species from Portugal, hence their name Portuguese Millipedes. They first arrived in Adelaide in 1953 but have since spread throughout southern parts of Australia. While not harmful to humans, they can release a secretion when disturbed that will stain furnishings etc - and can be an irritant to eyes. Nick has confirmed that many of the locos have both a sander (to drop sand onto the tracks for traction) and millipede blower at each end of the engine. As too much sand on the tracks can cause issues, the millipede blowers are also used to blow away sand after the loco has passed.